It's been a busy start to the New Year. As well as getting on with the day job of keeping local children safe and well, we've been preparing for the Department for Education's visit. We're continuing to roll out our new approach to improving our practice - Signs of Safety - read more below. But we also know that we need to reduce the number of cases you're managing, so this month we're launching a new social worker recruitment campaign - 'We're with You'. We'll be sharing more information with you about this soon. But most importantly, we want to hear from you. Is our communication right? Are you able to share your views? Please take a few minutes to fill in our quick survey so we can make sure we are getting things right. And remember, you can contact me any time about what we're doing and your ideas for improvement. 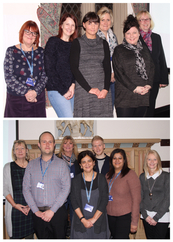 The Department for Education visited the Council to review our progress against the Children’s Services Improvement Plan and Improvement Notice yesterday (Tuesday 2 February). Their focus was Looked After Children. They met with young people in care and care leavers and held a focus group with foster carers, adopters, social workers and team managers. We will feed back soon about their visit. Latest figures show Coventry and Warwickshire is carrying out care proceedings quicker than the legal limit of 26 weeks. Over the last two years the length of proceedings has reduced from an average of 44 weeks to an impressive 24.4 weeks. A number of procedures have changed, but key to the steady improvement has been partnership working across the local family justice system and the introduction of a new role of Court Progression Officer. Julie Newman, Legal Services Manager, said: "It's great to see our times continuing to improve, but the people who are benefiting most from this are the children involved." The next drama performance by the Canley Theatre Group will be a play called “What are they like”, a National Theatre 500 Competition play which will be performed at three youth centres. The production follows the success of ‘Ctrl Alt Del’ and involves young people from across the city. It was written by Lucinda Coxon – who also wrote the script for hit film ‘The Danish Girl’ - and is about adolescence. Read more. A new approach to improving how we work with families is being rolled out across Children’s Services. Signs of Safety helps everyone involved with a child/young person – including the child/young person themselves – to think about ways to keep safe, healthy and settled, wherever they are living. More than 90 people have now been trained in how to apply the Signs of Safety approach in their practice. The latest group to be trained is pictured above. There are more courses planned over the next few months. Check out when in the Children’s Services Training Portfolio on Beacon. Three new social workers have joined, or will join, Early Help and Prevention Service – and this will increase to five over the next couple of months, once recruitment is finalised. Their role includes carrying a small caseload, but they will be fundamental in supporting and helping staff, partners and organisations to manage risk at lower levels of intervention. Read more. Safeguarding conferences are now taking place in the new conference suite on floor two of Broadgate House. Families and agencies who attend the conferences are being directed to use the entrances to the Customer Service Centre in the Upper Precinct - next to River Island or up the ramp from Broadgate onto the first floor balcony overlooking the Precinct. The Safeguarding Team is still based in the east wing of Broadgate House. Implement the workforce strategy to stabilise the workforce and reduce the reliance on agency workers. The new social worker recruitment campaign “We’re with You” will help with this. Improve the quality and consistency of practice by continuing to progress through auditing and quality assurance, ensuring that learning is being fed back in to practice. Ensure that there is a greater availability of placement choice for all children by implementing the placement sufficiency strategy. Reduced to 1426 - 36.1% (515) of these were referred to social care. 3 out of 10 CAFs are held by Health or schools (not led by us). Our target is for that to be 4 out of 10 led by other agencies. 28 children have been adopted and 49 placed. We expect 50 children to be adopted by the end of March 2016.